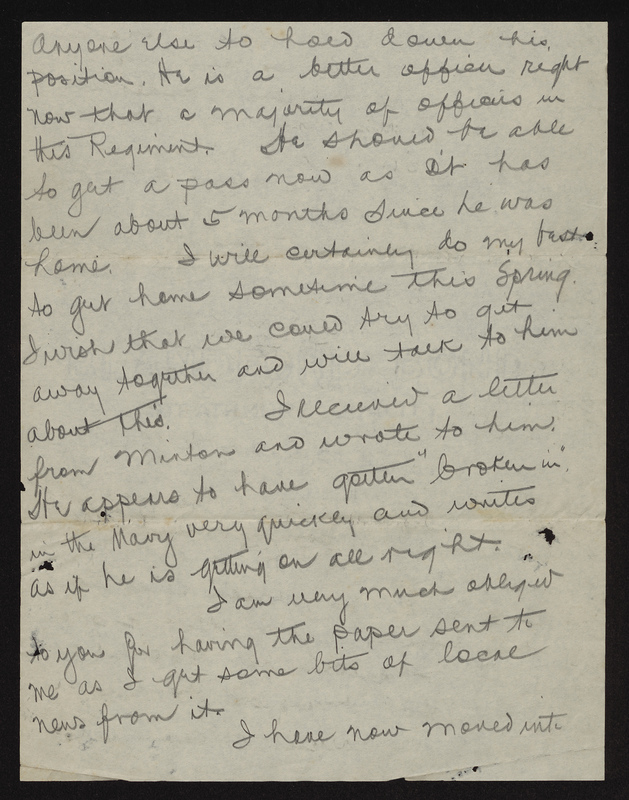 Letter from Richard Dillard Dixon written to his father on February 24, 1918. I received your letter Wednesday and have sent the check for the insurance to Mr. Gettys2 and you probably will get the receipt some time this week. This is like a new regiment now. The change has stirred every officer up and all of them are trying to improve the batteries to which they were sent. It was a good idea to change them around. I have been busier in the last month than ever before. 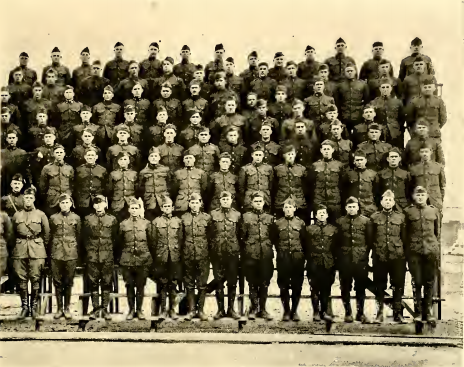 A considerable number of officers have been sent to Fort Sill, Oklahoma3–some to study aviation and others to study artillery. No battery now has more than 3 officers when 5 is the regular compliment. So you can see how we have extra duties to perform gives me more time with the battery as at first I went on the range every day. There is no danger in my getting hurt on the range. I do not have to even get anywhere near the powder. Capt. 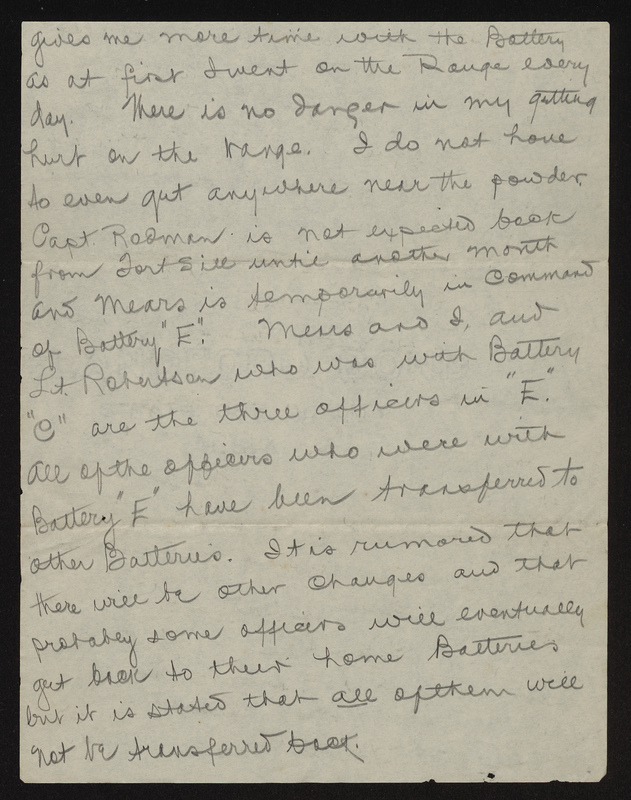 Rodman4 is not expected back from Fort Sill3 until another month and Mears5 is temporarily in command of Battery “E.”6 Mears5 and I, and Lt. Robertson7 who was with Battery “C”8 are the three officers in “E.”6 All of the officers who were with Battery “E”6 have been transferred to other batteries. It is rumored that there will be other changes and that probably some officers will eventually get back to their home batteries but it is stated that all of them will not be transferred back. We have also recently gone into some problems in school that are more complex and different than any we have had since coming here. The first examination on them I made 65 but last week made 87 and last Friday I am quite confident I did better than this. Tho the papers haven’t been returned yet Lieut. 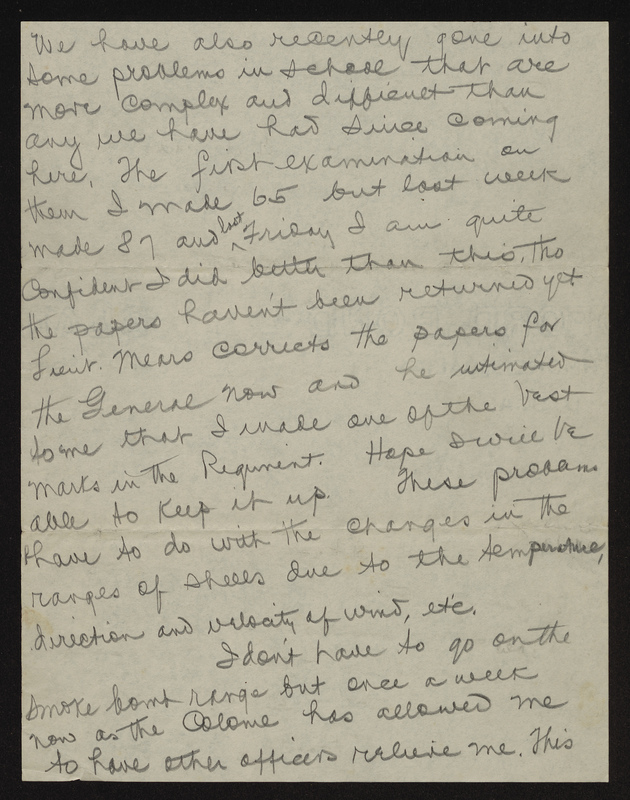 Mears5 corrects the papers for the general9 now and he intimated to me that I made one of the best marks in the regiment. Hope I will be able to keep it up. These problems have to do with the changes in the ranges of shells due to the temperature, direction and velocity of wind, etc. I don’t have to go on the smoke bomb range but once a week now as the colonel has allowed me to have other officers relieve me. This good weather gives us a chance to exercise the horses and we take one or two horseback rides every day. Each battery now has 150 horses. I was very much grieved to hear of Robt. Drane10 being wounded and trust it is not serious. Please let me know what you hear of him from D. Drane11 from time to time. I am spending the day in camp today as Lt. Robertson7 has gone to his home (Hillsboro, N.C.)12 and Mears’5 family and fiancée13 are in Greenville14 and he is spending the day with them. Brownie15 phoned me last night that he was coming over to take dinner with me today. He is on divisional guard today which keeps him very busy. Brownie15 is making a good officer and shouldn’t get discouraged and I have been trying to get him to feel that he is just as capable as anyone else to hold down his position. He is a better officer right now than a majority of officers in this regiment. He should be able to get a pass now as it has been about 5 months since he was home. I will certainly do my best to get home sometime this spring. I wish that we could try to get away together and will talk to him about this. I received a letter from Minton16 and wrote to him. He appears to have gotten “broken in” in the Navy very quickly and writes as if he is getting on all right. I am very much obliged to you for having the paper sent to me as I get some bits of local news from it. I have now moved into Capt. Weddell’s17 former house with Mears.5 Mears5 has been living with Capt. Weddell17 since last fall. These quarters are the best in the regiment. Our living-room is a small house 12 x 15 ft. made of tongue and groove and is very comfortable.18 We sleep under a regular canvas-tent in the rear of the house. The sleeping-quarters have a wooden-floor and sides about 5 ft. high. We are very comfortably situated now and I hope this arrangement will continue for Mears5 is a smart, industrious fellow and I can do more studying by living with him. 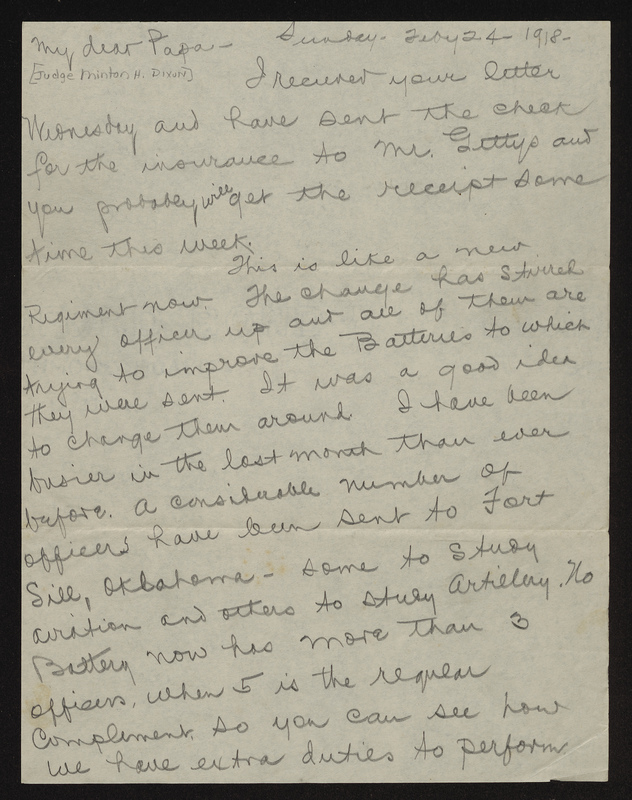 The original officers in Battery “A”19 were not very studious or interested in the work and I naturally was to some extent influenced by them. I am always so glad to hear from you and hope you will write as often as you feel like it. I am glad that you have been able to be out in the sun and I am sure you feel better from it. Identity unknown; possibly Lee Alexander Gettys (1887-1968), a member of the “Shelby Dynasty” political machine within North Carolina’s Democratic Party. Both Richard Dillard Dixon and his father had connections with this faction led by O. Max Gardner. 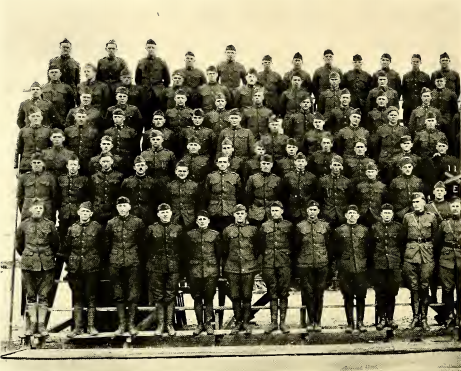 For more information on Fort Sill’ role in World War I, see the entry on the army base in The Encyclopedia of Oklahoma History and Culture, link: http://www.okhistory.org/publications/enc/entry.php?entry=FO038. Son of former North Carolina Supreme Court Justice William Blount Rodman, Wiley Croom Rodman grew up in Washington, North Carolina, where his family exerted extensive political influence. Graduating from UNC-Chapel Hill in 1896, Rodman later briefly attended West Point before practicing as an attorney in his hometown, which he also represented in the state legislature from 1913 to 1914. He also played a significant role in the National Guard, even briefly commanding the 2nd North Carolina Infantry during its part in the Mexican Expedition against Poncho Villa in 1916. 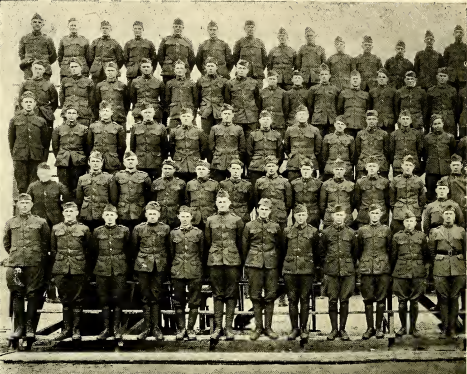 With the consent of the state’s governor, Rodman recruited the unit that formed the core of Battery B, 113th Field Artillery. Served with the unit through its demobilization. 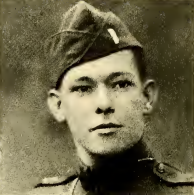 From 1923-1924, Rodman was the state commander of the American Legion. Photograph from the History of the 113th Field Artillery. link: https://archive.org/details/historyof113thfi00flet. Born in Baltimore, son of a flour wholesaler, Mears was a bookkeeper for the family firm, White & Company, before the war. 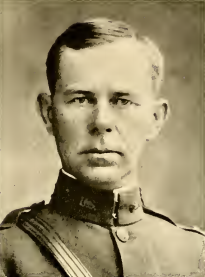 A member of the pre-war Officer Reserve Corps, he quickly received a promotion to 1st Lieutenant. Transferred to the 113th Field Artillery from the 314th Field Artillery, he spent the rest of the war with the regiment. Upon his discharge, Mears returned to Baltimore, where he worked as secretary of the Crescent Candy Company before returning to White & Company as a director. 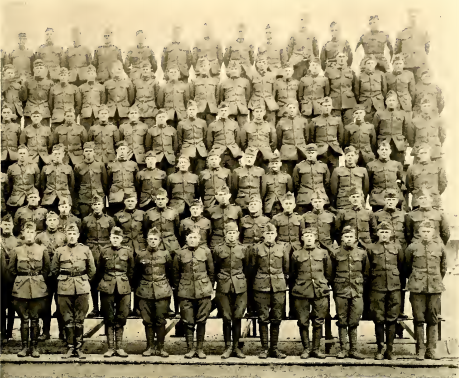 Photograph from the History of the 113th Field Artillery. link: https://archive.org/details/historyof113thfi00flet. 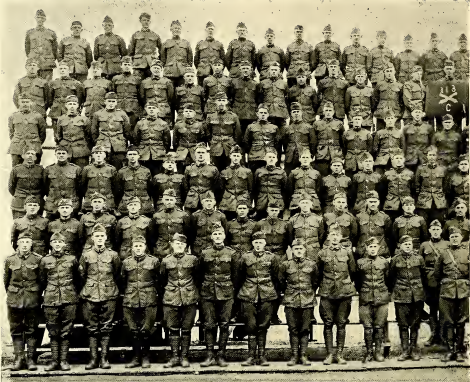 Group photograph of Battery E, 113th Field Artillery. From the History of the 113th Field Artillery. link: https://archive.org/details/historyof113thfi00flet. Born in Greensboro, lived in Hillsborough, attended UNC-Chapel Hill. Worked as a textile mill superintendent. Part of the National Guard inducted into federal service, he eventually transferred to the 120th Infantry. Severely wounded during the Somme Offensive on October 18, 1918 by machine gun fire and left ten percent disabled. Died in Wilson. 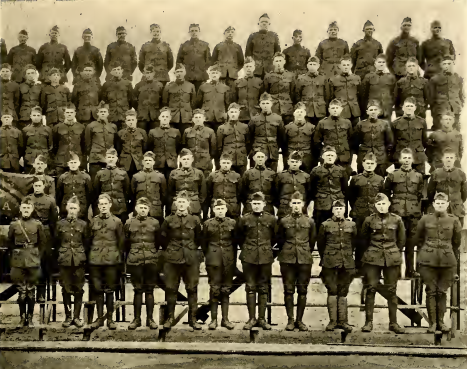 Group photograph of Battery C, 113th Field Artillery. From the History of the 113th Field Artillery. link: https://archive.org/details/historyof113thfi00flet. Son of Robert Brent Drane II, the episcopal minister in Edenton. He graduated from the UNC-Chapel Hill in 1912, and attended medical school at the University of Wisconsin. Enlisted in the US Army immediately after the entrance of the country into the Great War. 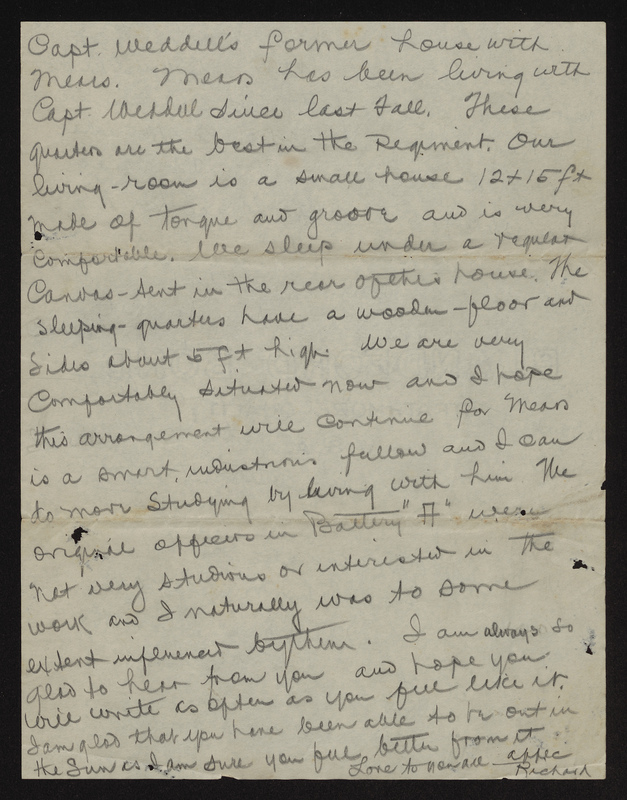 Assigned to the Medical Corps, gassed on February 5, 1918 while attached to the British Army’s 11th Field Ambulance. Promoted to captain. After discharge, moved to Savannah, Georgia, where he worked as a physician. Reverend Doctor Drane; episcopal priest at St. Paul’s Episcopal Church in Edenton. His father, also an episcopal minister, died in Wilmington during the yellow fever epidemic in 1862. An 1875 graduate of the General Theological Seminary in New York, Drane served as the rector at St. Paul’s from 1876 until 1932. Father of Robert Brent Drane III. 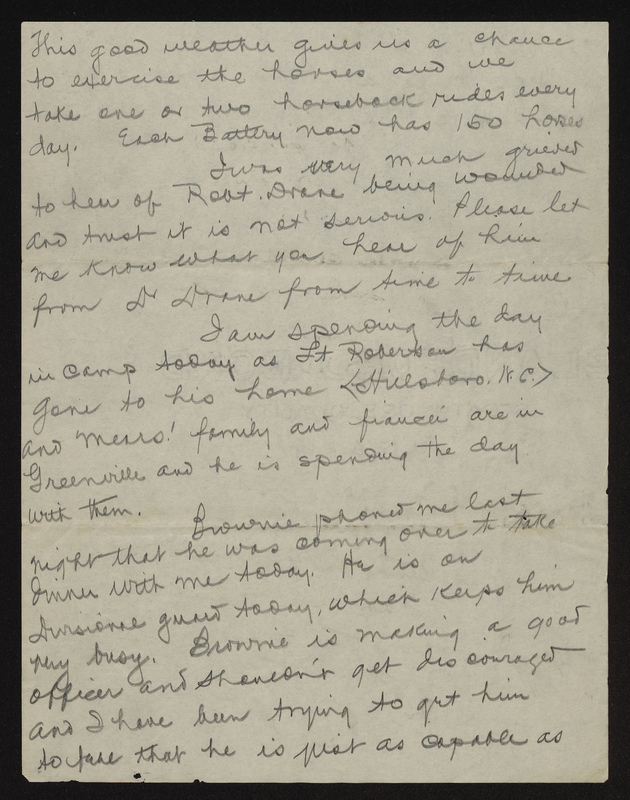 For more information, see the biographical profile in the Robert Brent Drane Papers at Wilson Library, UNC-Chapel Hill, link: http://finding-aids.lib.unc.edu/02987/. Hillsborough, North Carolina; “Birdseye view” of the town, circa 1905-1915. link: http://dc.lib.unc.edu/cdm/ref/collection/nc_post/id/3432. Wilson Library, UNC-Chapel Hill. Christian Emmerich Mears married Dorothy May Packham (1894-1947) on May 6, 1919 in Baltimore, Maryland. Officer’s Quarters at Camp Sevier. link: https://cdm16821.contentdm.oclc.org/digital/collection/p16821coll9/id/980/rec/13. South Carolina Digital Library.